Become a 401(k) Sales Champion! A complete development program for advisors that want to launch, grow, and improve their 401(k) business. Let us help you market and grow your 401(k) business. Don't miss our free 3-part webinar - click here to register today! ABGRM has partnered with industry leaders KnowHow 401(k), LLC and 401(k) Marketing, LLC to help our Investment Advisor partners effectively market to plan sponsors and increase their retirement plan business. We are now able to offer a complete sales training and marketing package to advisors in all stages of their careers through two programs, The 401(k) Sales Champion Workshop and 401(k) Retirement Plan Marketing In A Box. Combined, these programs provide the “know how” with the “how to” of retirement plan marketing. We support Advisors and your pursuit of 401(k) and other group retirement plans because we believe in your ability to have a positive impact upon our joint plan sponsor and plan participant clients. Together we can assist each to achieve their respective goals for why they sponsored and why they participate in the plan. The 401(k) Sales Champion Workshop is the online, anytime on any device 401(k) sales and service training professional development experience for Advisors. Since the launch of the online version of the workshop in 2012, over 4000 Advisors have been given access to the 401(k) Sales Champion Workshop. 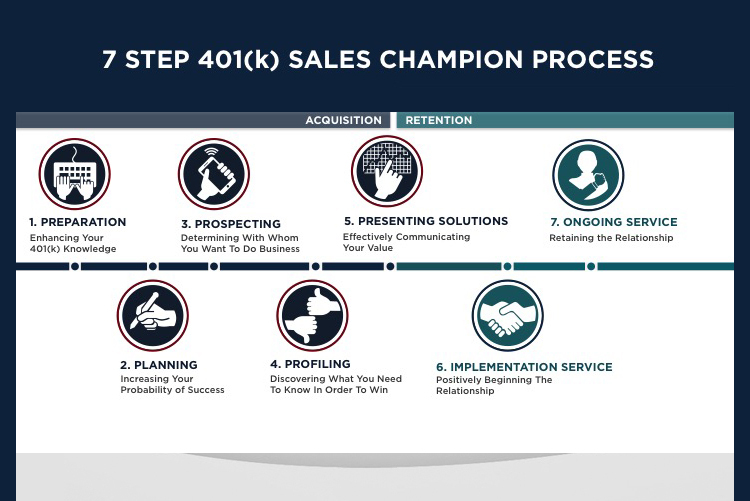 The 401(k) Sales Champion Workshop discusses best practices to grow and improve your 401(k) business covering 109 topics via 36 video segments, supported by 30 E-Tools all catalogued within a 7 step process to acquire and retain your plans. When you have a question or comment simply hit the Contact Your Coach button to be connected with Chris Barlow and ABGRM. The workshop tells the story of how Chris and thousands of Advisors he has worked with the past three decades have built their 401(k) business. www.knowhow401k.biz hosts the workshop. To enhance your confidence of the disciplines of plan design and plan administration KnowHow 401(k) has partnered with NIPA, the National Association of Pension Administrators to provide you with the Fundamentals of Qualified Retirement Plans within Step #1 Preparation. There are three outcomes we want you to achieve as a result of using the information and tools found within the 401(k) Sales Champion Workshop. Confidence: you will confirm that 401(k) and other group retirement plans is a market that you want to pursue, and you understand what it is going to take as far as time, frustration and effort to achieve your goals. Prepared: you will be prepared to answer the 2 big questions plan sponsors want you to answer. Why should they allow you to work with them and their employees? Why is your recommendation better than what they have now? Focus: if you build a business plan and write specifically what you need to do daily in order to achieve your long term goals, you are more apt to stick to it.